Though the strawberry picking season has passed, the endless fresh berry picking list is coming into its own. All these tiny bursts of sweetness are dangling from its branches and canes, waiting to be picked and enjoyed in some culinary delight. Blueberries, raspberries, mulberries – what tops your list of a favorite berry to pick? I’m a huge raspberry fan! But the one real trick, at least for me during the fruit-bearing season is finding easy, delicious ways to savor that fresh and intense sweet berry flavor in a simple dessert. Did I say how much I desire simple, especially in the kitchen? So if you are like me, always scouring the cookbooks for an easy berry dessert, one that won’t heat things up during the summertime sizzle, here’s a Cooks.com recipe (with Annie alterations) that whips up faster than a pop tart and tastes absolutely gorgeous. The recipe calls for canned fruit but here’s where you can add either your own preserves you canned last year or fresh fruit that you just picked from the local grower, a nature walk or your own garden. Whip/blend the cream, cream cheese and confectioner sugar for three minutes in your Kitchen Aid. Pour and spread into the graham cracker crust. Let it set up for about 30 minutes in the fridge before adding your fruit. I added last year’s raspberry freezer jam, which tastes as good as fresh picked berries. Add a touch of vanilla to your creamy blend. If you are doing fresh blueberries, add a tsp. of vanilla, a pinch of cinnamon and nutmeg and you’ll get a crumble flavor without making the crumble. This would also make an easy key-lime pie if you want to add the lime flavor but this is a berry blog so let’s stay fruity right now. Test this one out on your family. And how much easier can it get? Plus it’s a big hit and no one knows it was that simple except for you. Now that’s a secret worth keeping. Madam Benoit understands my way of cooking best. “I feel a recipe is only a theme, which an intelligent cook can play each time with a variation.” So vary your summer dessert ideas and get creative with this easy recipe. 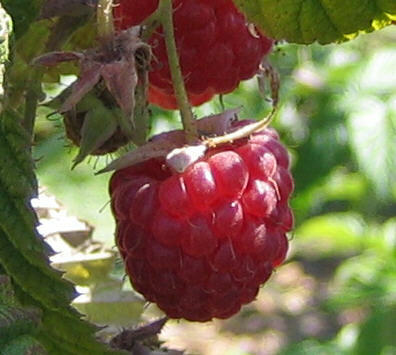 Image of raspberries from the Internet – this morning’s sun angle is just too difficult for that tiny Blackberry camera.